I know, long title, right? I love a good spoof. 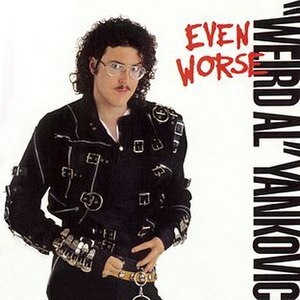 I grew up on the musical parodies of Weird Al Yankovic, and at his best his twists on the popular songs, like Michael Jackson’s “Bad,” both honored and poked fun of the originals. Most artists it seems are happy to give him permission to use their music, knowing that once you’ve been spoofed by Weird Al, you have arrived. I took the one more traveled by. I suppose you needn’t know anything about Robert Frost’s “The Road Not Taken,” but if you do the parody is that much more delightful, and yet not disrespectful of the original at all. Previous Post Day 20 on the way! That was really a well put to together video. Well read and just the right tone. I did LOL a bit it has to because of the sinister look you gave when you put your glasses on at the end! Wonderful! 🙂 That’s just perfect. Job accomplished 😉 Thank you, dear. Though high, its melody was scarce. I guess I didn’t know that Mozambique was a country, not a town then. Nice! Thanks for posting that here. 🙂 And I shall have to check that book, and more of Koch’s poems out. Hahaha! SO marvelous, both the poem and your reading. The finale-with-glasses certainly does stick the landing, but on the way there, the little facial twitch right before “Forgive me” and the small flash of a manic grin at “juicy” are priceless. You have a gift for parody, I see! Thank you so much, Jen. This was a particularly fun one to do. Ah, thank you so much! I am working on uploading today’s reading now, it’s a new favorite of mine by Kay Ryan. Should be ready shortly. 🙂 I really appreciate the comments and compliments by the way. It makes me very happy to hear that folks are enjoying these.